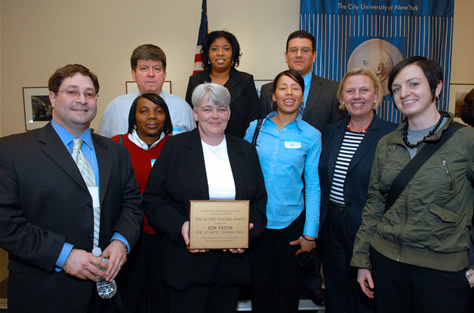 The Metropolitan Placement Consortium was formed in 2007 by the New York State Commission for the New York State Commission for the Blind and its partner agencies in order to expand employment opportunities for youth and adults who are blind or deaf-blind. 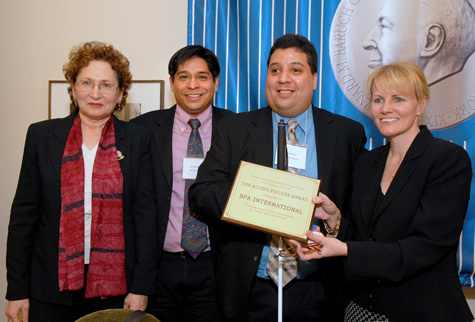 We want to take this opportunity to thank Baruch College Computer Center for Visually Impaired People for inviting the Consortium to present its first annual Access Awards. The members of the consortium are pleased to recognize employers who have benefited from hiring from the talented pool of job applicants that we represent. BPA International’s office in Cedarhurst, New York has made extraordinary outreach efforts to recruit individuals who are blind. In just 18 months, BPA, a world leader in media auditing, has hired and retained eight individuals as quality assurance specialists who listen to recorded conversations between customer service representatives and callers and rate performance. The company and its human resources department has not only hired employees for entry level positions, but has provided opportunities for growth, enhancing the roles of two of its blind employees to include training and project coordination, as well as research. BPA and its representatives, Lisa Renda and Gladys Benson, are honored for building access by expanding opportunities and recognizing potential of employees who are legally blind. In 2007, Metropolitan College of New York, whose educational programs are based in experiential learning, partnered with Visions to create internship positions for trainees who needed to gain work experience using newly acquired skills. The college’s representatives, Christina Joseph and Steven Lenhart, wanted to expose the trainees to more than entry level, routine tasks. The college created nine internship opportunities which are available on an ongoing basis in the President’s Office, Administration, Admissions, Library and Career Services. One intern is learning both the technical and communications skills required of an executive assistant – in the President’s office. Another completed his internship with the Assistant Dean of Administration and was quickly hired for a support position in the entertainment industry. 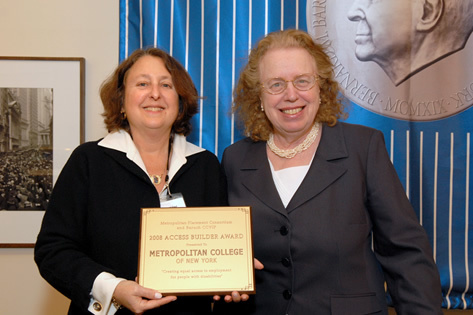 Metropolitan College of New York is honored for building access to competitive internship opportunities. Technology issues often present significant challenges to employers who wish to hire employees who are blind. Keyspan and its human resources manager, saw opportunities rather than challenges in hiring a well-qualified candidate for their Melville, Long Island call center. Keyspan’s IT department worked with an access technology specialist to ensure that their call center systems worked with magnification software. They also implemented Lighthouse International’s recommendations to create a workspace area that could accommodate a closed circuit television that would provide access to print, and provided other space solutions. In 2007, Lighthouse called upon Keyspan once more, this time with a request to create access to the company’s call center systems for employees who require screen reading software to accomplish customer service tasks. Once more, Keyspan worked with a tech specialist funded by the Commission for the Blind and Visually Handicapped to create a fully accessible work environment, then interviewed and hired a successful employee who is totally blind. 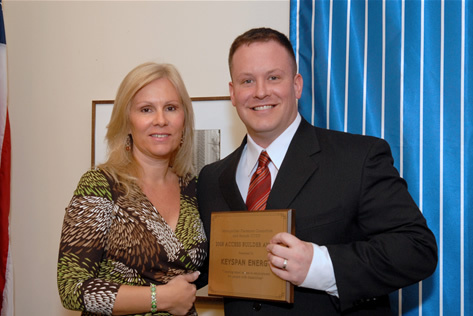 Keyspan Energy is honored for building access to jobs through technology. Selling managers on the idea of hiring through supported employment programs can be challenging, especially in constantly changing retail environments. Kim Paton, Store Manager at DSW’s Atlantic Terminal Mall store in Brooklyn, not only bought the idea; she worked closely with Goodwill’s employment specialists and job coaches to ensure successful employment for two young men who began working in the store’s stock processing area. The employees who are blind appreciate that Kim treats them exactly the way she treats every other member of her staff. Says Kim, “We sell shoes, and if somehow we can provide an opportunity for someone to improve their life, well, that just makes work all the better.” Kim Paton of DSW is honored for building access to successful employment outcomes for those in supported employment programs. In a town of 9,000, the local paper is at the heart of the community. Tom Leek, editor of Port Jervis’s Evening Gazette, is always busy, but he was not too busy to welcome a young intern. 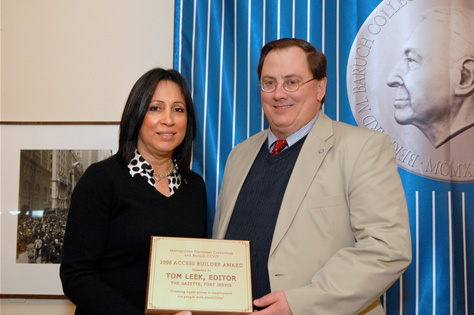 Tom mentored the fledgling reporter throughout the internship, and before long, the intern was rewarded with several articles in print. Tom also took time to meet the employment specialist from the Association for the Visually Impaired, who told him of another person who was seeking an internship. That same day, Tom called some local business owners and set up two appointments for the job seeker, a Port Jervis resident who had been seeking employment unsuccessfully for a number of years. Because of Tom’s efforts, a computer company offered this soon-to-be college graduate, an internship that should lead to full employment with benefits. Tom Leek, Evening Gazette editor, is honored for building access to employment opportunities within the local business community. Store managers rely on stockroom staff to keep goods flowing to the sales floor. William Najarro, manager of Express, knew he had found a dedicated, hard-working employee when he hired a woman who was deaf-blind as a stock processor. She immediately felt comfortable, not only because there were already two other individuals in her work area who were deaf, but because William and stock manager, Rainier Layug, demonstrated sensitivity to her needs and those of other deaf staff. Express recognized HKNC’s Community Services Program as a valuable staffing source, and quickly hired another deaf-blind individual. Knowing that communication among the team is key in retail sales, William, Rainier and other Express staff are learning sign language so that they can communicate more easily with team members who are deaf and deaf-blind. Rainier, the stock manager has been extremely supportive, advocating for staff so that they can better perform their jobs. Express has demonstrated a strong desire to help its employees with disabilities excel and recognizes that these dependable employees enhance their team. William Najarro, Rainier Layug, and the staff at Express are honored for building access through disability awareness and communication with their deaf and deaf-blind employees.